Apple-Branded Apples Not A Success. Sources within Apple retail say that, after a brief test market trial, Apple has abandoned a plan to sell Apple-branded apples in grocery stores. “Apple apples did not sell well, a source admitted. “It was probably that one big bite taken out of the side. I think our findings indicate that pre-bitten food is not a growth business. Or even a niche market. Or… any kind of market at all. Grocery industry experts say Apple’s first foray into the complicated world of grocering was not well conceived. “Well, see, the problem with the Apple apple… is the big bite taken out of it,” said Jeff Ganung, editor of Today’s Grocer, an industry magazine. 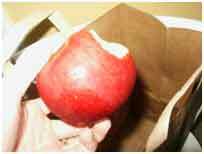 Ganung held up an Apple apple and pointed to the prominent bite taken out of it, which was designed to remind the grocery shopper of the company’s trademark logo, one of the most recognizable in the world. “See? A big bite… right out of the side… it’s not… I don’t… In general, people don’t want food that’s already been bitten in to. Ganung believes Apple misjudged the sophistication of the grocery shopper. “Shoppers were just left to wonder, who’s the guy who took a bite of this apple? Do I know him? Does he work at the grocery? The supplier? Does he floss? The remaining Apple apples are expected to be turned into a pie. Previous Previous post: Apple on WWDC: The First Three Rows Will Get Wet! Next Next post: All Shall Bow Before Us.